Emperor Go-Sai (後西天皇, Go-Sai-tennō, January 1, 1638 – March 22, 1685), also known as Emperor Go-Saiin (後西院天皇, Go-Saiin-tennō) was the 111th emperor of Japan, according to the traditional order of succession. Go-Sai's reign spanned the years from 1655 through 1663. This 17th-century sovereign was named after the 9th-century Emperor Junna and go- (後), translates as later, and thus, he could have been called the "Later Emperor Junna". Emperor Go-Sai could not pass the throne onto his descendants. For this reason, he was known as the Go-Saiin emperor, after an alternate name of Emperor Junna, who had confronted and reached an accommodation with similar issues. This emperor was also called "Emperor of the Western Palace" (西院の帝, Saiin no mikado). The Japanese word go has also been translated to mean the second one, and thus, this emperor might be identified as "Junna II". During the Meiji Era, the name became just Go-Sai. Before Go-Sai's ascension to the Chrysanthemum Throne, his personal name (imina) was Nagahito (良仁) or Yoshihito; and his pre-accession title was Hide-no-miya (秀宮) or Momozono-no-miya. He was the eighth son of Emperor Go-Mizunoo. He was raised as if he were the son of Tōfuku-mon'in. Former Empress Meishō was his elder sister by a different mother; and former Emperor Go-Kōmyō was his older brother by a different mother. Emperor Go-Sai's Imperial family lived with him in the Dairi of the Heian Palace. This family included at least 11 sons and 17 daughters, none of whom would ascend to the throne. Nagahito-shinnō became emperor when his emperor-brother died. This death left the throne vacant and the succession (senso) was received by the new monarch. Shortly thereafter, Emperor Go-Sai is considered to have acceded to the throne (sokui). The events during his lifetime shed light on his reign. The years of Go-Sai's reign correspond with a period in which Tokugawa Ietsuna was the leader at the pinnacle of the Tokugawa shogunate. Go-Sai married the daughter of the first Takamatsu-no-miya Yoshihito (高松宮好仁親王); and he succeeded as second Takamatsu-no-miya. Then this Imperial prince became the emperor as a temporary measure until his younger brother, Imperial Prince Satohito (識仁親王, Satohito-shinnō) could grow older. January 1, 1638: The birth of an Imperial prince who will become known by the posthumous name of Go-Sai-tennō. January 5, 1655: The death of Go-Kōmyō caused the succession (senso) to be passed to his brother; and when the succession (senso) was received, the reign of Emperor Go-Sai was deemed to commence. 1655 (Meireki 1): The new ambassador of Korea, arrived in Japan. March 2–3, 1657 (Meireki 3, 18–19th days of the 1st month): Great Fire of Meireki: The city of Edo was devastated by a violent fire. 1659 (Manji 5): In Edo, construction begins on the Ryogoku Bridge (ryogokubashi). 1661 (Manji 6): Imperial Palace in Kyoto is burnt to the ground; and the Gekū at Yamada was seriously damaged by fire. March 20, 1662 (Kanbun 2, 1st day of the 2nd month): There was a violent earthquake in Kyoto which destroyed the tomb of the Taiko, Toyotomi Hideyoshi. 1662 (Kanbun 2): Emperor Gosai ordered Tosa Hiromichi 土佐広通 (1561–1633), a Tosa school disciple, to adopt the name Sumiyoshi (probably in reference to a 13th-century painter, Sumiyoshi Keinin 住吉慶忍), upon assuming a position as official painter for the Sumiyoshi Taisha 住吉大社). March 5, 1663 (Kanbun 3, 26th day of the 1st month): Emperor Go-Sai abdicated, which meant that the Prince Satohito received the succession (senso). 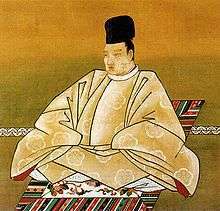 Shortly thereafter, Emperor Reigen formally acceded to the throne (sokui). After abdicating, Go-sai put his heart into scholarship and he left behind many books, including the "Water and Sun Collection" (Suinichishū, 水日集). He was talented in waka; and he had a profound understanding of the classics. During his reign, because of great fires at the Grand Ise Shrine, Osaka Castle, and the Imperial Palace, among others, the Great Meireki Fire, earthquakes in the region, and because of repeated floods, many people blamed the Emperor, saying he lacked moral virtue. March 26, 1685 (Jōkyō 2, 22nd day of the 2nd month): Former-Emperor Go-Sai died; and a great comet was observed crossing the night sky. Emperor Go-Sai is enshrined in the imperial mausoleum, Tsuki no wa no misasagi, at Sennyū-ji in Higashiyama-ku, Kyoto. Also enshrined are Go-Sai's immediate predecessors, Emperor Go-Mizunoo, Empress Meishō and Go-Kōmyō. Go-Sai's immediate Imperial successors, including Reigen, Higashiyama, Nakamikado, Sakuramachi, Momozono, Go-Sakuramachi and Go-Momozono, are enshrined here as well. At the at Kitano Shrine, a tablet over the Chu-mon entryway reads tenmangu in the calligraphy of Emperor Go-sai. The years of Go-Sai's reign are more specifically identified by more than one era name or nengō. 1 2 3 4 5 Ponsonby-Fane, Richard. (1959). The Imperial House of Japan, pp. 116. 1 2 3 4 5 6 Titsingh, Isaac. (1834). Annales des empereurs du japon, p. 413. ↑ Titsingh, p. 413. A distinct act of senso is unrecognized prior to Emperor Tenji; and all sovereigns except Jitō, Yōzei, Go-Toba, and Fushimi have senso and sokui in the same year until the reign of Emperor Go-Murakami – see Varley, H. Paul. (1980).Jinnō Shōtōki, p. 44. 1 2 3 4 Meyer, Eva-Maria. (1999). Japans Kaiserhof in der Edo-Zeit, p. 186. ↑ Martin, John. (2002). Kyoto: A Cultural Guide to Japan's Ancient Imperial City, pp. 287–288.